Of all the Greek Islands — and there are thousands of them — Santorini is probably the one most people have heard of. And also probably the one that most people dream of visiting. Santorini is where you will find the red cliffs, black beaches, white windmills, and blue domes that adorn so many postcards. And, bonus: Santorini isn't *just* about blue domes and sunsets. 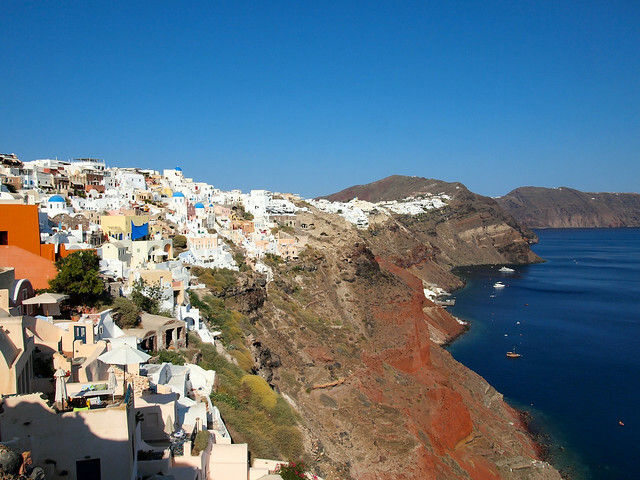 There are lots of cool things to do in Santorini, too! 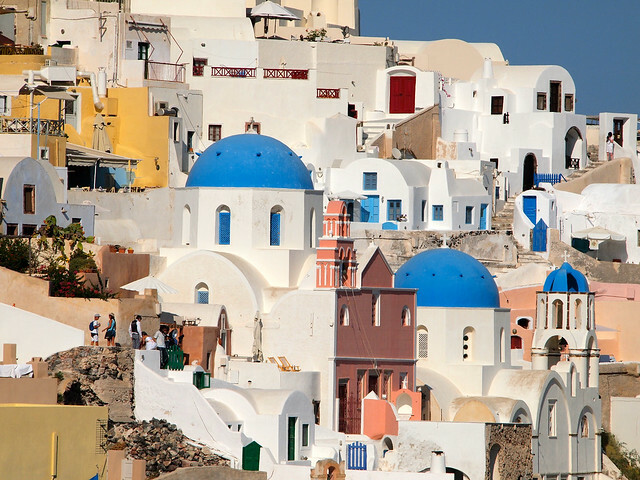 A must-see while on Santorini is the village of Oia (pronounced “ee-uh“). Here you'll find those red cliffs, white windmills, and blue-domed churches from the postcards. I went to Oia twice in 2.5 days on Santorini — once for sunset, and once to explore the town in the afternoon. And I fell in love. Oia is absolutely stunning, and is worth a few hours of your time at the very least. You can easily catch a bus here from Fira — and do it in the afternoon so you catch the best light AND avoid the cruise ship crowd at sunset time. Along with visiting Oia at least once, I also highly recommend somehow getting out on the water in Santorini's volcanic caldera. 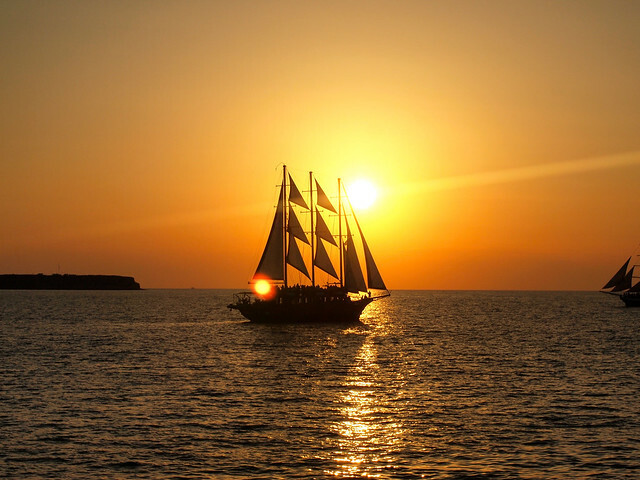 I was exploring the Greek Islands with Intrepid Travel, and my group (with the help of our tour leader) decided to pitch in to charter a traditional Greek boat and captain for a few hours one evening. >> Book a sunset catamaran cruise here. I've heard of “fish spas” before — but mostly in Asia. On Santorini, however, I saw no less than 3 in Fira alone. If you've never heard of a fish spa before, basically you stick your feet in some water and have tiny fish nibble all the dead skin off. I convinced two other girls from my tour group to join me in this adventure. None of us left our 30-minute session convinced that our feet were any smoother or healthier, but it was a fun, giggle-filled experience nonetheless. Lastly, if you are up for it, it's quite popular to hike along the caldera all the way from Fira to Oia on Santorini. I opted out of said hike since it can take anywhere from 3 to 5 hours and offers little to no shade, but I know others who have done it and absolutely loved it. You can also climb to the site of Ancient Thira on top of the island. 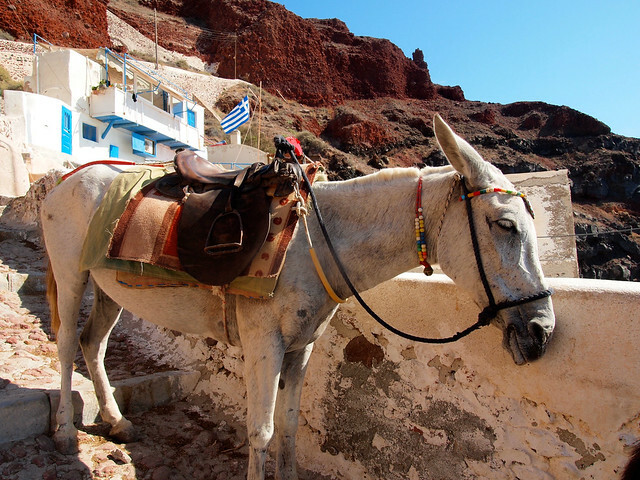 Many people (probably those who have watched movies set in Greece) dream of riding a donkey up a steep trail on a Greek island. 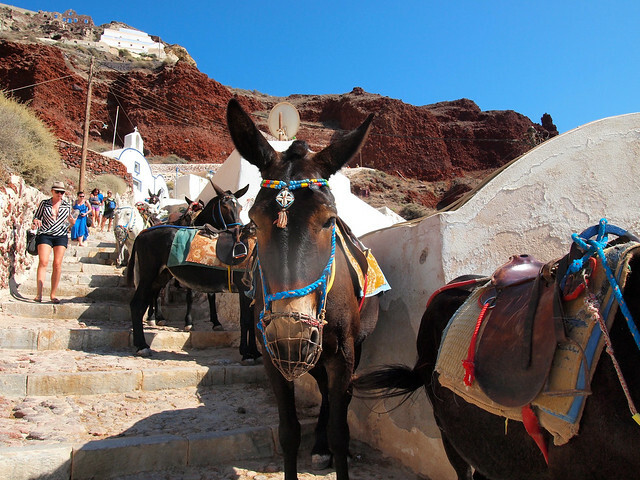 And there are indeed donkey trails in Santorini, in both Fira and Oia that overlook the caldera. I urge you to forego these rides, though. After walking the donkey trail in Oia from bottom to top myself, I feel truly terrible for any animal who has to carry a human up it. While none of the donkeys I saw looked blatantly mistreated on Santorini, they didn't appear to have access to drinking water, and they certain did not look very happy. With fine black sand and crystal-clear water that is the perfect shade of blue, Perissa may have been my favorite beach in Greece. Yes, it's an organized beach — you'll pay 5 Euro for 2 sun beds and an umbrella, and there are restaurants and taverns nearby — but the sand and water were just perfection (though, beware that black sand gets HOT in the sun!). 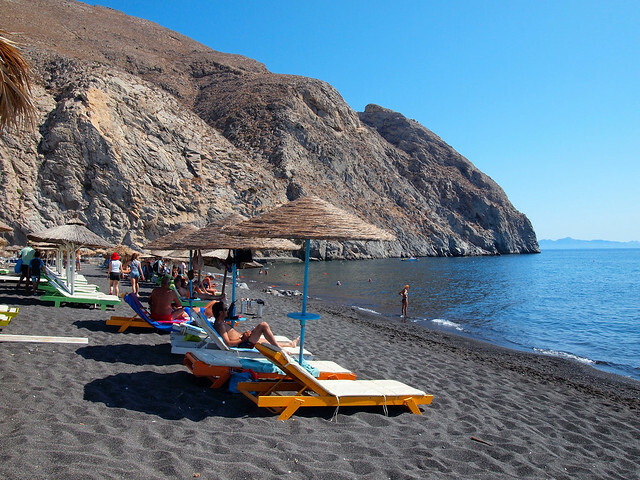 Other popular Santorini beaches include Kamari Beach (another organized beach, this time with pebbles), Monolithos Beach (a kid-friendly beach), and Red Beach (an isolated red-pebble beach that requires hiking to reach). Yes, Santorini is touristy. And yes, Santorini CAN get crowded. But what makes Santorini really special is that it is still able to live up to your expectations of a Greek island paradise if you let it. There are plenty of Santorini hotels and guest houses to choose from. 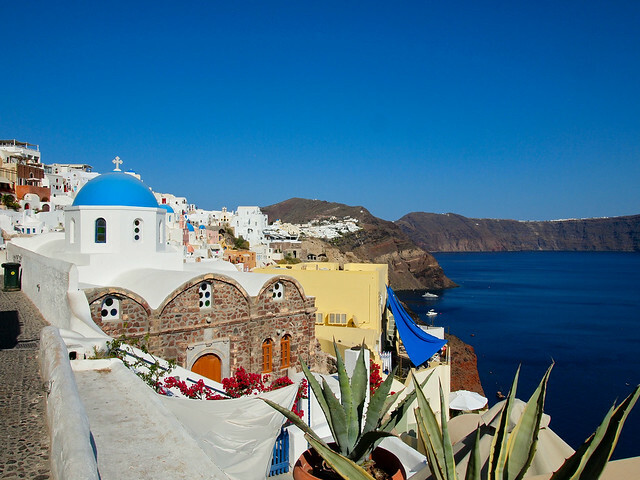 Many people want to stay in Oia for its pretty views, but you can almost certainly find better prices staying in Fira. 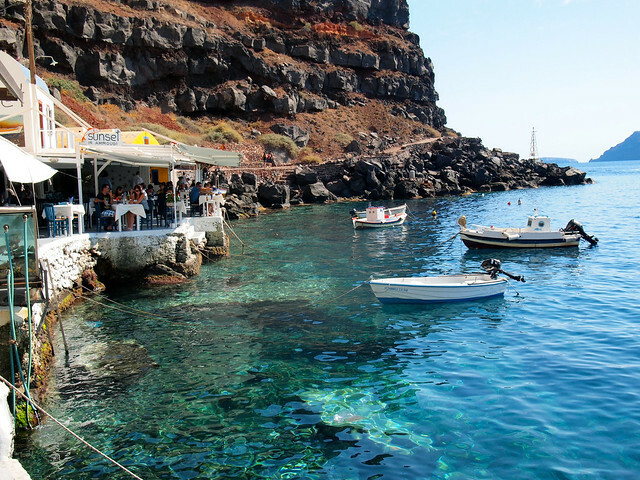 Fira is also the site of Santorini's main ferry port — so look for a hotel that offers a shuttle service to/from the port. This will save you trying to catch a cab (nearly impossible during high season), cramming into a cable car, or schlepping your things up 500+ steep steps on the donkey trail. I stayed at Pension Petros, which is a small, family-run hotel close to Fira's main square but away from most of the noise. Another great option in Fira is the Evgenia Villas & Suites, which is often rated as one of the best-value hotels in Santorini. If a luxury hotel in Oia IS what you're looking for, check out Katikies Hotel (often named the best hotel in Santorini) or the Astra Suites. Believe it or not, food on Santorini is actually affordable — less expensive than on Mykonos, in fact! 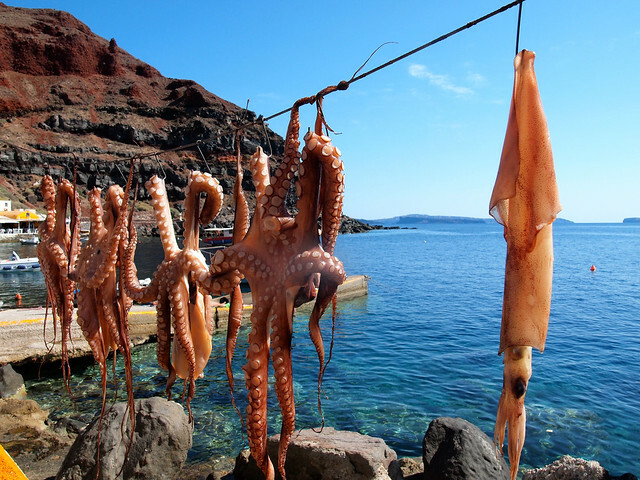 Some Santorini specialties include cherry tomatoes and white eggplant, along with fresh seafood. For breakfast, check out Corner Crepes and Waffles (near Pension Petros in Fira) for delicious crepes, waffles, and fresh orange juice. If you head to Oia and want a meal with a view, visit Seagull for fresh salads and seafood — and a killer view of the Aegean and one of those blue-domed churches. If it's cheap you're looking for, go for gyros at Nick's in Fira's main square. Santorini has a fairly decent bus system that will get you to/from Fira and Oia and also to the most popular beaches. Frequency of buses depends on the season and where you're going, so simply stop at the bus station to grab a timetable (they always had them in Fira) before you plan your outings. Bus tickets cost 1.60-2.20 Euro. You can also rent cars on Santorini, though renting ATVs (quad bikes) is probably more popular. I would warn you, however, that the roads on Santorini can be twisty and narrow and kind of terrifying. 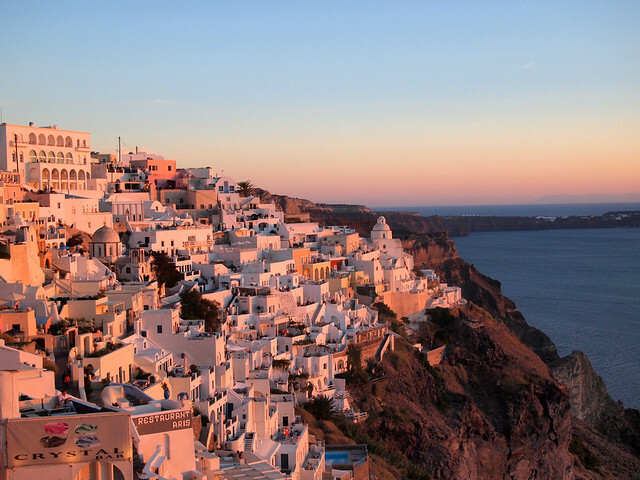 I won't sugarcoat it: Santorini CAN get crowded. If you want to avoid the cruise ship crowds, explore Fira early in the morning or evening. If you want to go to Oia, go in the afternoon; most people turn up for sunset, but the afternoon hours are best for photography anyway. And, of course, you can always head to quieter parts of the island if the crowds get to be too much. 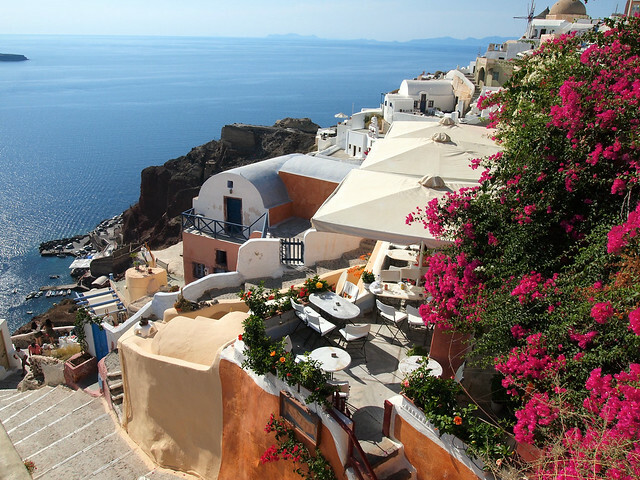 Is Santorini on YOUR travel wish list? What would you most like to see there? 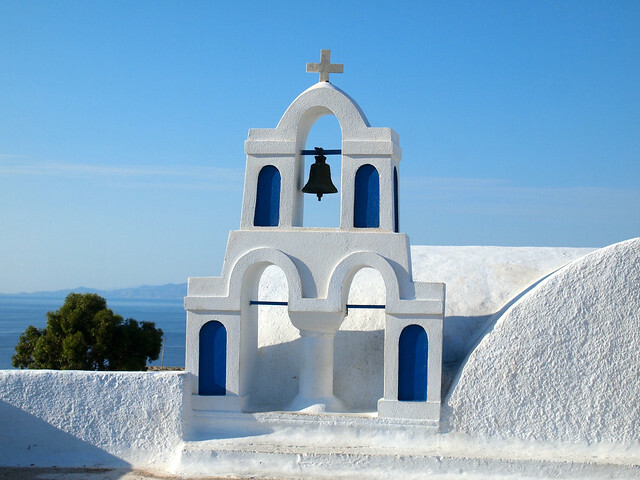 *Note: I received a complimentary Greek Islands tour from Intrepid Travel through my partnership with them, which included my visit to Santorini. All opinions, as always, are entirely my own. This was very helpful. I’ve been to Santorini but by cruise so I didn’t get to.enjoy the beach! Heading there again for honeymoon this time on our own. Any recommenations how to get there from Rome? I always want to visit other islands as well. Is it hard to travel around? Oooo it wil be lovely for a honeymoon! As for getting there, the easiest would be to fly to Athens from Rome, and then catch a ferry to Santorini – it’ll take you 6 hours by slow ferry, or half that by high-speed ferry. It shouldn’t be too difficult to book, either – you may even be able to book it online (we always just got the tickets directly at the ferry terminal, though). And no, it’s not hard to get to other islands. The big ferries that operate in that area are all very nice. 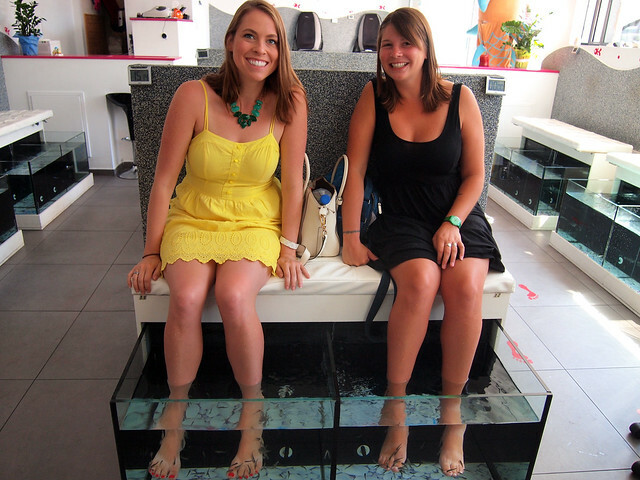 The different between fish foot spas in Europe and Asia: in Europe they’re nice and tiny, but in Asia they are HUGE fish that CHOMP CHOMP CHOMP your feet off! And they trick you, with tanks of tiny fish in the front before they take you to the huge ones! I think it might be time to finally see Santorini after 11 trips to other islands (including a few visits to Crete, which is big, but has lots of variety and the most amazing beach I’ve seen in Greece, complete with pink sand at Elafonisi). My parents stayed in Perissa when they visited Santorini and explored the island from there. I definitely need to go! I would definitely recommend visiting. This is one of those places in the world that is popular for a reason – because it’s amazing! I LOVED SantorinI! Is that Kissingfish foot spa? That’s the one I went to while I was there and thought it was a great, clean place. It looks pretty similar but then again I guess any fish spa can look alike. Your photos are amazing and make me want to return! Not sure what the name of the fish spa was… it was really close to the main square in Fira, though. Haha, I’m definitely going to have to check out these man-eating fish in Asia! I have a hard time saying which Greek Island is my favorite… but I think it may well be Santorini. 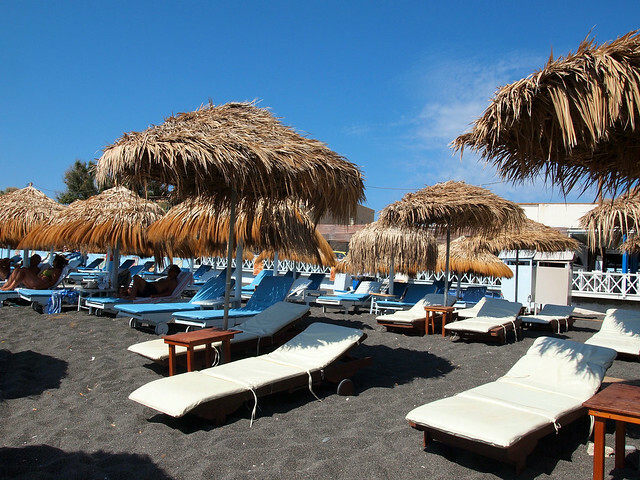 I loved Santorini too, but I didn’t have a chance to visit the black beach. It looks like you really made use of your time there, you even went to the volcano! Yes, we tried to see as much as possible! Though, saying that, it was still a very relaxing few days. What an insanely helpful guide to Santorini! I think I’ll pass on the fish spa, but the volcanic spring looks like a must. Also, your sunset photo is stunning! Thanks, Christina! The fish spa definitely wouldn’t be for everyone. But I would highly recommend all the volcano stuff! The hot spring doesn’t appear to be super well-known, and it IS a bit smelly. But the mud was lovely and the water very warm. Sooo easy to gain weight in Greece – all the food is so good! Haha, I imagine that most people would find the fish spa concept to be a bit silly. You definitely should head to the Greek Islands though, Alex! You are indeed very close! This is a great guide! Beautiful photos too. I just did the fish pedicure in Budapest and have to agree that it didn’t do much. Still fun though! 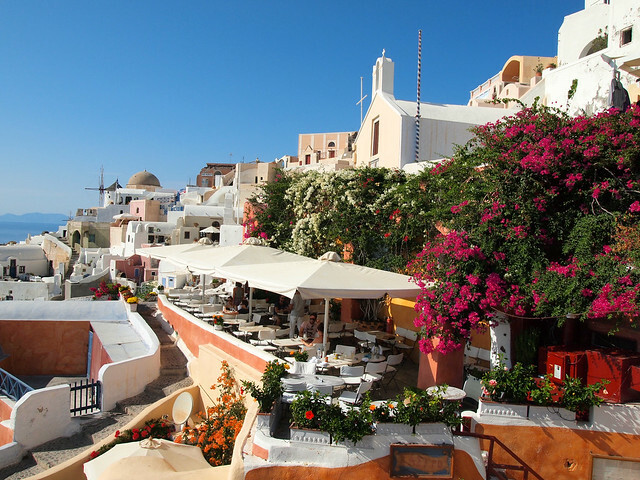 I loved sitting on terraces in Oia and alternating between Greek coffee and Santorini wine! All the terraces in Oia are great. I’m already dreaming of going back! I honestly think it would be difficult to truly dislike this place. Thanks for checking it out! It’s well worth a visit, though I’m sure South America will be amazing, too! Ughhhh it’s such a paradise! Definitely high up on my dream destination list!!! Gorgeous pics! I can’t believe you haven’t been to the Greek Islands yet, Andi! I feel like they would be right up your alley! This post makes me want to go back to Santorini so bad!! We only had a few hours there which was only enough time to quickly run around Fira and take a few pictures. We knew we missed a lot of this beautiful island but your post definitely shows us that we MUST return. A few hours is definitely NOT enough time to do Santorini justice! I hope you get a chance to go back someday! sorry for the type ….wish to be * in the postcard island someday !!! It was a dream destination for me, too, and I was really happy that it lived up to my expectations. Great shots, I especially like your zoomed in shot of the buildings. Looks like an amazing place. It’s always been high on my list and perhaps it’s time to go! Thanks for sharing. Thanks, Ed! It’s not difficult to get some great shots on this island though, to be honest. You should definitely cross it off your own list soon! WoW ! Its very nice place for travelling. All pics are very nice. I can understand that! I wanted to stay longer, too. Gorgeous photos Amanda. I hope to follow in your footsteps next year to see some of these islands. Thanks, Andrea! 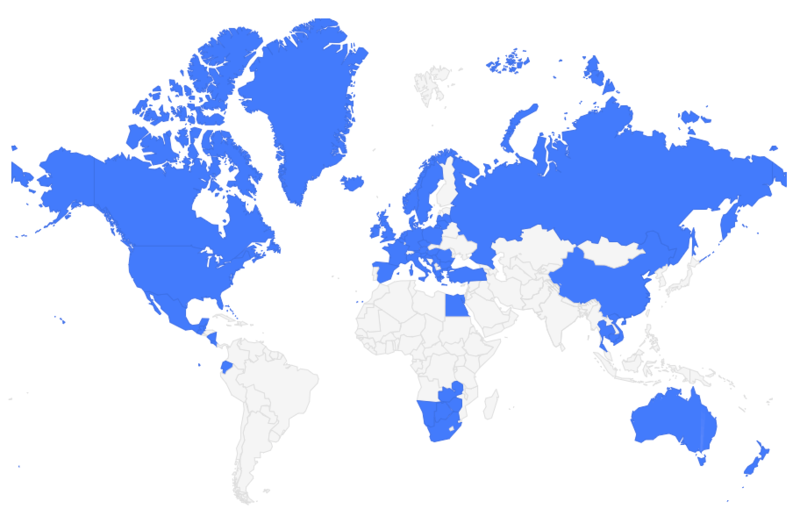 I hope you get a chance to go to some of these places next year. Great guide to Santorini, thank you. It is a truly remarkable island. Thanks! And I agree – it’s a great island. Wow these pictures are gorgeous!! 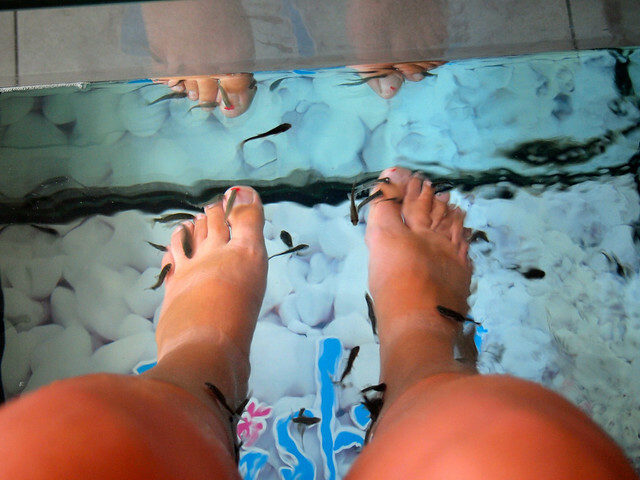 I think I would be WAY too tickleish for the “fish spa” I’m doing a Study Abroad program to Greece in May and can’t wait! I thought I was going to be too ticklish for the fish spa, too, but it wasn’t as bad as I feared! Have a great time in Greece. And definitely get to Santorini if you can! Ahhh I’m so excited for you! Santorini is a really amazing island. I hope you love it as much as I did! Thanks so much, Allie! And yes, Santorini was incredible! I’ll definitely be going back someday! Am planning to visit santorini in the month of November for my honeymoon! But i keep getting advises from people asking me to drop the idea of visiting Greece coz of the economic problems it’s been facing for the past few months! Is it still safe to visit santorini coz I still want to be there for my honeymoon! The thing about Greece is, the Greek Islands are completely different than mainland Greece. Throughout all of Greece’s economic struggles, the islands have been absolutely fine because tourism is much more stable than everything else. 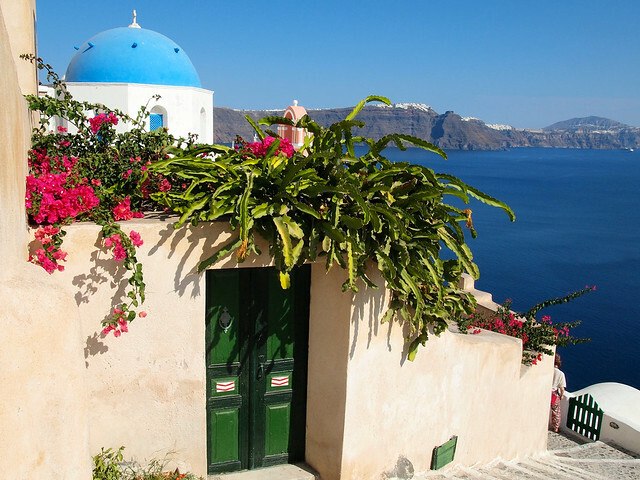 Santorini especially should be 100% safe – and gorgeous, of course! You can check out my friend Kate’s post about being in Greece during the economic collapse: http://www.adventurouskate.com/is-it-safe-to-travel-to-greece-right-now-absolutely/ She had NO problems on any of the islands. Her only tip is to take some extra cash so you don’t have to rely on ATMs as much. We’re planning to make a trip to Greece in December and asked a travel agency for guidance but they said there won’t be any ferries operating to Santorini or Mykonos from Athens until the end of March! So is there any other way we can travel to those islands?! I would double check on that if you can by going directly to some of the ferry websites. Things DO slow down in the winter, but I can’t believe that there would be absolutely NO ferries to the most popular islands in December. I’m not a travel agent, though, and I can only speak from my own experience visiting in September. But I would definitely do some more research! If the ferries aren’t running, I think your only other option would be to look into flights (there *are* very small airports on some of the islands). I agree. You can certainly avoid the crowds in Santorini if you want to. It is nowhere near as bad as you think and there is plenty to do and lots of places to go to get away from the hustle and bustle. To be honest, I hardly noticed the crowds. I felt very comfortable and relaxed in Santorini. I’ll be spending 5 days in Santorini this summer, can’t wait and thanks for all the recs. Hope you love it as much as I did, Divya! The town’s scenic character along with the traditional cave houses and the renowned white-painted buildings will compose a mental image you will never forget! You can also stroll to the ruins of the town’s castle of Saint Nikolaos, while we share with you everything you need to know about the history and the local customs. Great post by the way! 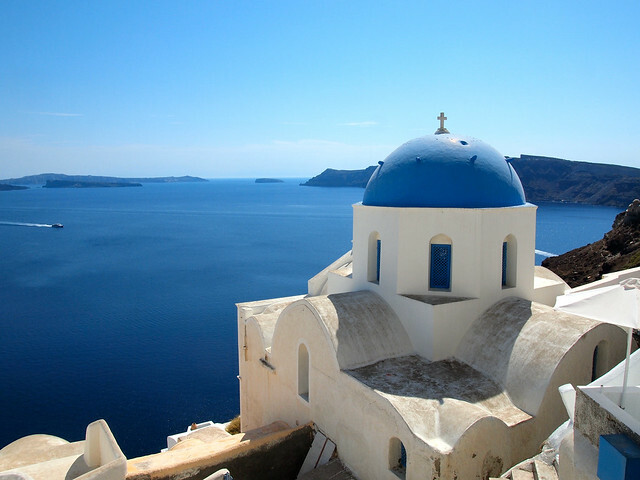 I am interested in the Intrepid Tour Athens to Santorini but I am not sure if it is the right tour for me. I love the idea of combing Athens with the islands however I am not a swimmer so will that restrict me from doing any of the activities on the islands? Would I be able to get away with just lying on the beach? I I want to go in September so I feel I could justify just lazing around! Please help. What kind of clothing is suitable for everyday wear. Do we need to dress for dinner. Do you know what the weather is like in mid-October. This is our first trip overseas other than England. I’m excited and a little scared all rolled into one. Is everything cash or is debit ok? 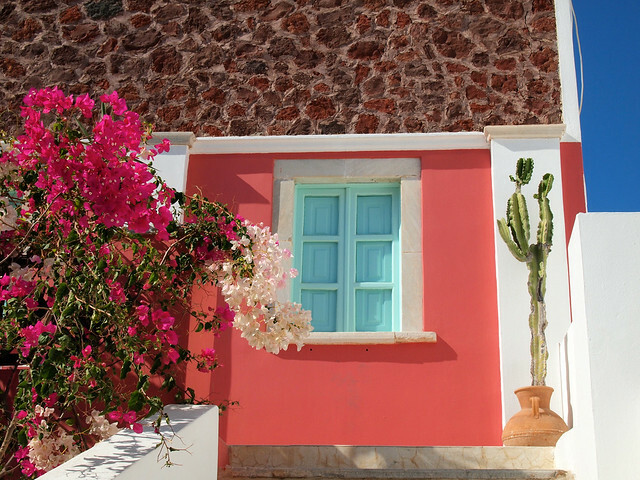 Where is Fira on the island….we’re staying at Cavo Blanco. Hi Denise. I can’t answer all these questions for you, I’m afraid – some of them you will need to Google (such as the weather in mid-October). Any kind of clothing is fine for everyday wear. It was still hot when I was there in September, and most people were in summery clothing. As for dressing for dinner, that entirely depends on where you will be eating. I did not eat anywhere fancy. And if you look at a map, Fira is more or less in the middle of the island. Oia is at the top. I’m not familiar with Cavo Blanco. But if it is a resort they may be able to answer some of your questions (and help you get around the island) better than me! Thank you….we leave for Santorini on Sunday……is the airport really a nightmare as I’ve read…. Unfortunately I don’t have any experience with the airport, as I arrived and left from Santorini via ferry. If you’ve heard horror stories, though, I would definitely get there extra early!